Teachers and librarians often look for books with an Australian theme to complement studies kids are involved in at school. Books like this make a great gift for young children overseas, too, as they transmit a little about the Australian culture or way of life. Here are some 2013 children's picture books I've read recently, all of which have something to do with Australia. Jacko and the Beanstalk: Kel Richards and Rob Ainsworth, Scholastic Australia 2013. Lots of Australian flavour in this book: "Never thinks, no thanks - Jacko's thick as three short planks. Jacko spent all Mum's money, On Magic seeds…that's not funny!" Children will enjoy the energy and wackiness, with lots of sound words and places to join in. They'll love the vibrant illustrations and spying out the geckos throughout the book. Jacko and the Beanstalk would also be ideal to turn into a reader's theatre or improvise on the text as the basis for a class play. There Was an Old Lady Who Swallowed a Mozzie: P.Crumble and Louis Shea, Scholastic Australia 2013. Lure reluctant readers with this one! The cover is lenticular, with a very goofy-looking old lady either showing a gummy closed mouth, or revealing a mosquito perched on her tongue, depending how you tilt the book. With lines like "It made her spew! What a shock! ", it's not for the faint-hearted but the Australian vernacular comes through loud and clear. The illustrations depict a tough old broad whose masochistic efforts to catch that swallowed mozzie will have kids clutching their sides. Cumulative stories like this make excellent fodder for puppet plays, re-telling and felt board stories. Koalas, Kites and Kangaroos, An Australian Alphabet Book: David Ridyard and Doreen Gristwood, Scholastic Australia 2013. 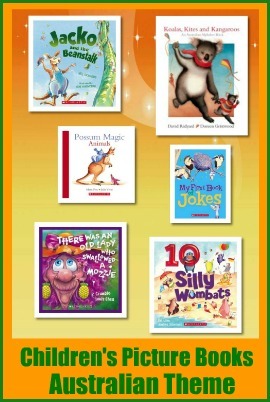 Now reprinted, Koalas, Kites and Kangaroos makes a nice addition to a primary school library's resource collection on Australia. Alphabet books are so important for pre-schoolers and other young learners, and this one's rather lovely. Each page has a prominent alphabet letter and also lists several words starting with that letter. Words are mostly nouns, not all, and some start with different sounds the letter makes e.g. the O page has olives, orange and owl. Illustrations are gentle, detailed and lots of fun - the double page spread makes a great "spot the picture" puzzle activity, with each word somewhere to be found in the illustration. The last page lists still more words hidden in the illustrations and asks kids to go back and find them - a nice way of nudging them towards an understanding of using alphabetical order to locate. Possum Magic Animals: Omnibus Book for Scholastic Australia 2013. Here's a very cute board book, based on the characters made famous by Mem Fox and Julie Vivas. Basically one animal and one word to a page, it's lovely and sturdy, perfect for little ones who are just starting to hold their own books. A great gift for babies or toddlers with a sibling who owns the more grown-up classic Possum Magic. 10 Silly Wombats: Ed Allen and Andrea Edmonds, Scholastic Australia 2013. I like the idea of a counting book with silly wombats in it! I also like the idea of picture book text kids can sing along with. For young borrowers just learning to read, this makes a very simple picture book they'll be able to read aloud to adults so much more easily. Set to the tune of Ten Green Bottles, each double page spread reveals the total of wombats as their number is depleted by silly accidents. My First Book of Jokes: Mark Guthrie (ill), Scholastic Australia 2013. Another very simple picture book that will appeal to the K-3 set and jokesmiths. The Australian theme is not present in every joke but most have recognisable animals or vocabulary Aussie kids will know. The jokes themselves tap into children's sense of humour - What do you call criminals robbing a jewellery store? Knickers! (and the animal thieves are wearing underpant masks on their heads.) I hope school librarians will buy this one for their libraries - we all know the kids who will want to giggle over this one with their friends at lunchtime! I think most children who enjoy animal stories will find an affinity for these books.